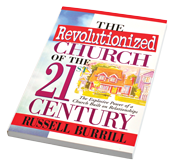 In The Revolutionized Church of the 21st Century, the author addresses our urgent need to recover a sense of community through small, relational groups. But this is not just another handbook on how to conduct small groups. This is a heart cry - rooted in the history of the early Christian church and in early Adventist history as well - to make small, nurturing, relational groups the central organizing principle of our churches. If the church can once again recapture the awesome and magnetic power of such small groups, the work will show up en masse to bask in the love, support and affirmation they find there.